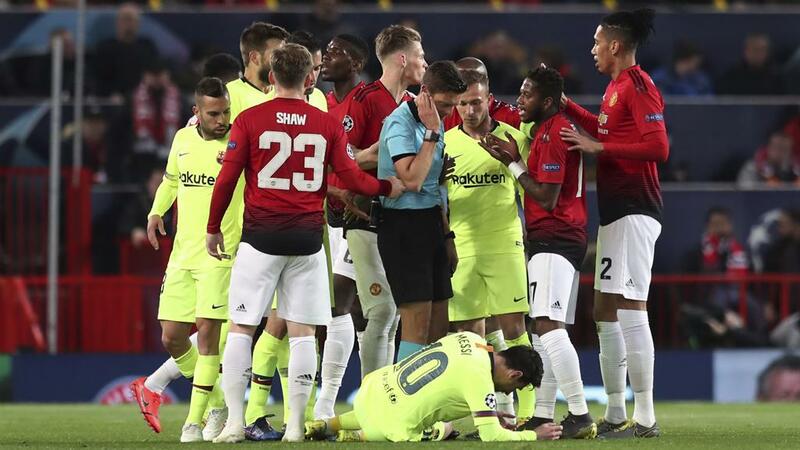 Manchester United defender, Chris Smalling has blamed Ole Gunnar Solskjaer’s men for their 1-0 defeat to Barcelona in the Champions League quarter-final first leg encounter at Old Trafford. He also spoke on his clash with Barcelona captain, Lionel Messi that left the Argentine international bleeding. Smalling, who left Messi with a bloodied nose after an aerial challenge with the 31 year old, said the contest with the Barca number 10 came when they were right on the front foot. The centre-back blamed United players for not scoring a goal against Ernesto Valverde’s men after creating some good chances during the encounter. A first-half own goal from Luke Shaw gave the La Liga champions a slender lead to take back to Camp Nou for next week’s second leg fixture. “I think the challenge with Messi came when we were right on the front foot,” Smalling told BT Sport. “We had to bring the intensity they’re not used to every week and there’s a lot to play for in second leg. “We pressed them high and made it difficult. It’s a shame we couldn’t get the goal. I thought we created some good chances. “We had a spell in the first half where we went after them and then we looked nervy, but after half time we got at them. “The whole team, we nullified them. I think there was only one other save for David de Gea. We knew we had to bring that intensity that they’re not used to.